The Edge-Lit Menu Sign and Other Restaurant Displays Are Sold on this Website. Over 4000 Products are featured in this Online Catalog. 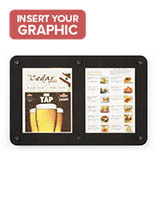 This Edge-Lit Menu Holder is a Popular Item for Shop Owners. 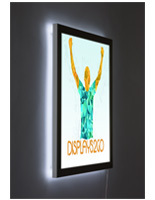 Graphics are placed between 2 acrylic panels and lit from behind by an LED board. 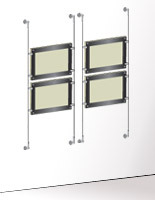 Hardware enclosed: standoffs to screw to a wall, chains to hang and suction cups to stick to windows. The silver border highlights Duratrans prints, although images on printer paper can also be used for signage. This clear plastic edge-lit menu holder is very thin when compared to a normal lighted box. With a thickness of just 1-1/8", this product can attach in places other illuminated boxes can't. 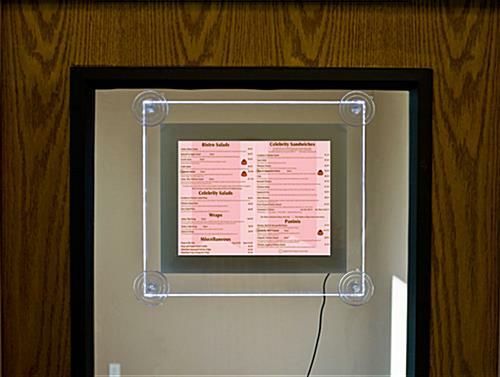 This very thin edge-lit menu holder can hang from the ceiling by using the included hardware. 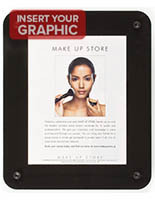 This lighted advertisement frame can fix to walls by screwing the signage into a surface with the enclosed standoffs, screws and anchors. 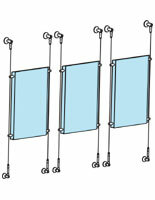 This edge-lit menu holder attaches to windowpanes with the suction cup provided. 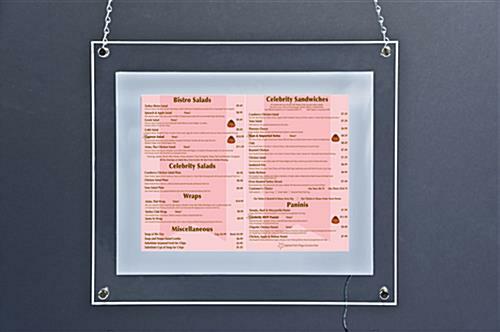 These sign frames make menus glow in an eatery window, allowing images to catch the attention of every passerby. 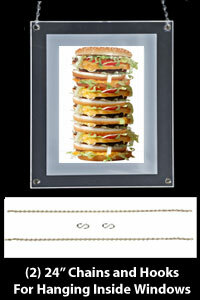 The plastic edge-lit menu holder that hangs with chain is a top rate unit for most any kind of store. Highlight important signage or advertisements in this brightly lit graphics sign. This edge-lit menu holder that hangs in a shop is opened by removing the four chrome standoffs and sliding in a photo. This makes exchanging out signage from this product fairly simple. Switching the power on and off is easy too, since the electrical switch is positioned right on the cord. 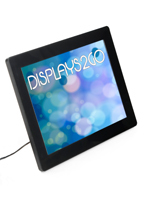 This edge-lit menu holder, like a backlit graphics sign, will illuminate a plain sheet of paper. Most anyone can make their own unique signage, and these acrylic LED signs will light them up. The edge-lit menu holder that makes a poster glow is superb for a number of purposes. 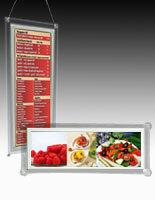 This sign is great for displaying restaurant menus and also for highlighting store posters. 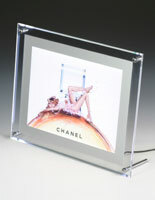 The slender acrylic lighted box, edge-lit menu holder can be used to light up an advertising sign. Any graphic will be more noticeable once inserted in these frames thanks to the illumination. This window mount, edge-lit menu holder is a fantastic alternative to a neon board since the image can be changed out at any moment by merely having a new graphic printed. Click here for wall mounting instructions. Please Note: Allow for 1/4" border around your 11"x8.5" photo. 15.5" x 13.8" x 1.1"